Harry, Ron, Dumbledore and Hermione. WikiLemon has other articles regarding the Potter Puppet Pals series. The Potter Puppet Pals series is one of Neil Cicierega's major projects, formerly just in Flash animation, but has now expanded to actual puppet shows and even music. The basic idea is, "What would happen if Harry Potter was acted out with puppets... by INSANE people?" This has become Neil's most popular project with the release of The Mysterious Ticking Noise, surpassing even The Ultimate Showdown of Ultimate Destiny. One of Neil's few non-animutational animations, the animated Potter Puppet Pals series was animated piece by piece by Neil, without any tweening or anything, and was described by Neil as "tedious". After the first animation, Bothering Snape, which premiered four of the eventual six characters, he originally intended to make Potter Puppet Pals Adventure, for which he produced the audio, but thought it would be too hard to make. Instead, he made Trouble at Hogwarts, which would include two newcomers, Voldemort and Hermione, to round the animated cast to six. The original second episode of the Potter Puppet Pals animation series, cancelled because it would have been too tedious for Neil to animate. The Potter Puppet Pals Adventure is portrayed as a preview for a fake upcoming musical including the Potter Puppet Pals cast. It is narrated by Steven Milo, the composer, who gives commentary between songs. The MP3 file for The Potter Puppet Pals Adventure can be found here. It is currently being animated, and the work in progress version is available for your watching pleasure here. Potter Puppet Pals in "Wizard Angst"
Potter Puppet Pals in "School is for Losers"
Potter Puppet Pals in "2012"
Potter Puppet Pals in "Snape's Diary"
As of November 2006, Neil has created five short films with these real puppets, four of them episodes in the series. The first, Pppteaser, is simply showing off the new Snape puppet, while Potions Class, the first actual episode, actually had dialogue. The puppets were made by Nancy Cicierega. While Potions Class was performed using a couch as a makeshift stage, a real stage (with a similar look to the one seen in the Flash animations) was used in the video Wizard Angst. The stage was built by the Cicierega parents, Nancy and Jerry. The video The Mysterious Ticking Noise, released on March 23, 2007, has the entire gang singing to a strange ticking noise, with explosive results. The most recent video Wizard Swears, released on December 1, 2007, has Harry, Ron and Hermione trying out "Wizard Swears" and results in Dumbledore telling them the "Elder Swear". Potter Puppet Pals, consisting of Neil, Alora and Emmy, performed live for the first time at the Boston Yule Ball, Dec. 10, 2006. This show was around 9 minutes long and included musical numbers, including Avada Kedavra from Potter Puppet Pals Adventure, as well as new pieces. Hopefully Neil and co. release a home recorded version, because the girls screaming make much of it extremely hard to discern. The characters of Potter Puppet Pals are very much alike to the characters of the real Harry Potter books and movies Neil is spoofing off of, but in some ways, their personalities are a world different. The Harry puppet has rather spiky black hair, with the famed lightning bolt scar in the center. He has a pretty round head, black framed glasses, the left frame bigger than the other, each with no eyes shown inside, and with nothing connecting it to the rest of the head. He has two round circles for ears, and a very smiley expression, and whenever he opens his mouth, you can see it's tongue. It has the Hogwarts robe, dark gray with a very simplified version of the Hogwarts symbol. He has two rounded balls for hands, and a big arm protruding from the torso, obviously for controlling the puppet and keeping it up. The main protaganist of the Harry Potter series, and that has kind of... changed... in the Potter Puppet series. For example, Harry Potter PUPPET has been portrayed as nothing but a troublemaker, doing hardly more than bothering Snape, banging into him, and shoving him onto the floor. Oh, and Harry also has the ability to hug and, in wide opposition, use a machine gun. He can also ride a broom, and is the Seeker for the Gryffindor team as is shown in the first number of the Potter Puppet Pals Adventure, "Get The Snitch", like in the real Potter series. He used the "Pantaloonicus Poopicus spell on Snape in Wizard Angst. Harry Potter's first best friend met at Hogwarts... and... maybe even MORE than just a friend. The Ron puppet has orange hair with two tiny hairs sticking out on the top. He has two tiny dots for eyes, and a bunch of freckles on his cheeks- six on the left side, seven on the other. He has the standard Hogwarts robe, and smiley expression. Ronald also enjoys bothering Snape. Infact, he himself was picked to be on the BOTHER! shirt. Inside the episode, Trouble at Hogwarts, he comes up with the life-saving plan to escape the clutches of the Dark Lord Voldemort. In other words, MACHINE GUN! YAAAY!! Ron has shown many signs that he is in love with Hermione Granger in the real Harry Potter series, but inside this webseries, has almost shown none. However, it appears he is in love... with someone else. Ron, besides bothering Snape, enjoys listening and dancing to music, as shown in the very brief Aisha clip floating around on the internet, and also enjoys frollicking among the butterflies. He used the "Pantaloonicus Poopicus spell on Snape in Wizard Angst. Harry Potter's second best friend met at Hogwarts. The Hermione puppet has long brown hair that tends to flounce around like crazy. She has longer eyes than most of the characters, and has a very shiny highlight in the upper-left hand corner. She also has girly pink highlights on her cheeks, the standard Hogwarts robe, and the standard smiley expression. Hermione has never yet bothered Snape, but in the near future, she may give into the fad. Hermione also is the only student of Hogwarts seen using any form of spell. In the Butterflies hidden sequence, Hermione exclaims, "Ronicus Explodicus! ", wand raised high, and... well... makes Ron explode, head flying high above. In another act of violence towards Ron in the Potter Puppet Pals Adventure, Hermione is seen whipping Ron, who seems to be her slave boy. That scene was supposed to have been cut out. Hermione loves to learn, or at least says she does. We have yet to see her do ANY type of learning yet. He is Snape. The Potions master. The Snape puppet has a slightly paler and more elongated face, with a long pointy nose like an eagles', or like the Sesame Street puppet named "Bert". They actually have many similarities in personality, mainly wanting to be left alone, and are usually angry, and both have a very dull sarcastic sounding voice. He has longer hair than most of the cast besides Hermione, going down to about five-sixths down the face, going out like a womans' would. Also, in contrast to his pale body, he has a regularly flesh-toned arm sticking out from the bottom of his torso. He has a unibrow, two round eyes with black outlines and white filled in, a sad looking mouth, and when it opens, it points out like its' nose. It has a gray robe with a black shirt underneath. Severus is the victim of most of the bothering that goes around Hogwarts school. He has also killed Ron and Harry by the famed Avada Kedavra "Killing" curse in Bothering Snape, and also was killed himself by the self-same spell in Trouble at Hogwarts... but somehow, came back to life. In Emmy C. and Caitlin's first and at the moment only Ask Snape comic, that is explained. It seems as though every Saturday the Hogwarts staff plays Charades. Snape is the all-time champion, and that made him able to create a very convincing death when shot by the Avada Kedavra curse by Voldemort. However, he left with a scar... in a place usually not on display to the public. After the marvelous return of Snape at the end of Trouble at Hogwarts, he recieved a marvelous and rather long hug from Ron, Harry, Hermione... and Naked Dumbledore. Snape also seems to have a secret and lost love, as shown in the Potter Puppet Pals Adventure "Stopper On My Pain" sequence. Since it has yet to be animated, none know exactly who this lost love is. Neil says he planned to have it animated to Snape singing to a portrait of Gilderoy Lockhart. HSRT made it a love song to an enchanted muffin. As an added note, Snape's character is the most intact one from the original book series. The Dark Lord Voldemort. The dreaded antagonist of the series. The Voldemort puppet is depicted as a white faced black robed demon, with red eyes with black pupils, and sinister smile. Only known weaknesseses: machine guns and a swift BOTHER! He has an ambient echo voice to prove how evil he is, and is very smooth in his craft. Infact, he himself attempted to kill the self-proclaimed Potions Master! Now that's evil. And pathetic, because it didn't even work! Can't kill Snape. Remember that, now. Voldemort's most famed curse in both the real series and the webseries, is the Avada Kedavra "killing" curse. Voldemort constantly uses it in the series, and a whole musical number is devoted to it in the Potter Puppet Pals Adventure, portrayed in a catchy toetapper. There is approximately 10 times he utters the curse, 10 times you hear a zap in the background along with it, and 9 times you hear a scream of pain along with it, the ending scream is nowhere to be heard. Also, in Trouble at Hogwarts, Voldemort says it approximately one time, and one time where he was about to use it, but was stopped. You can escape from Voldemort easily, as shown in Trouble at Hogwarts, when Harry and Hermione quickly run off with any trouble, just by saying a simple 4 letter word... "WAIT!". He was killed by machine guns in the 2nd episode, but like all the other characters in the series, seems to have come back to life in the Potter Puppet Pals Adventure. Rubeus Hagrid has only been shown in the Potter Puppet Pals Adventure as of right now, in the musical sequence, "Half-Giant, Baby" and in "Ron's Disease". From what is seen and told, he is often ostracized from the rest because of his half-giant blood, but does embrace it at points. He also has a low suave singing voice. His puppet has long bushy eyebrows, hair, and beard. He is one of the only two who has a nose as of now. He has a darker flesh tone, and a brown coat with lighter brown buttons. His head is also a lot fatter than the rest, and so is his body. He takes commands easily if fish is promised. Draco Malfoy is a spoiled little brat with a lot of money, and Harry Potter's rival. He has the head shape of Ron, but has an extremely larger head compared to his, representing his big-headedness. He has light blonde hair, an angry expression, two darker yellow angry eyebrows and light blue eyes with a highlight and dark point. His robe is basically like the others, besides the fact his Hogwarts symbol is green and white, instead of red and yellow. He has so far only appeared in the Potter Puppet Pals Adventure. From what is said, Malfoy would love to do lots of harm to Potter. No puppet created yet. A miniature ‘puppet’ with Draco’s face attached to it WAS included in ‘Draco malfoy puppet,’ uploaded on the ‘potterpuppetpals channel. Ron just ADORES these butterflies. He probably frollicks with them ten times a day. First debuting in the secret scene in Trouble at Hogwarts, there are 4 of them, all on sticks, and very simplified. Basically four colored wings. The four colors are red, blue, pink and green. The red butterfly has a stick that goes straight up and down, the blue butterfly curves to the right, so does the pink, and the green butterfly curves to the right. The idea was probably based on the scene in the Chamber of Secrets movie when Ron and Harry see a trail of spiders leading into the forest, and Hagrid has given the words of advice to "follow the spiders". When entering into the forest, Ron exclaims, "Follow the spiders... why couldn't it have been follow the BUTTERFLIES?!". They can be seen in the last moments of Get the Snitch in the audience, if you use the scene by scene. Portrayed by a butternut squash with a Hogwarts uniform and face drawn on in biro. He made his first appearence in Wizard Swears.He has not appeared since then, due to the fact he was indeed a squash on a stick, therefor mostlikeley eaten or rotten. Neil and Emmy modelling some shirts. More here. Since the earlier days of Potter Puppet Pals, there have been the shirts to complement them. With the revival of Potter Puppet Pals with the live action videos, the store has been revived with new shirts. This is the list of design. The design of this store was later reused for the Lemon Demon store. 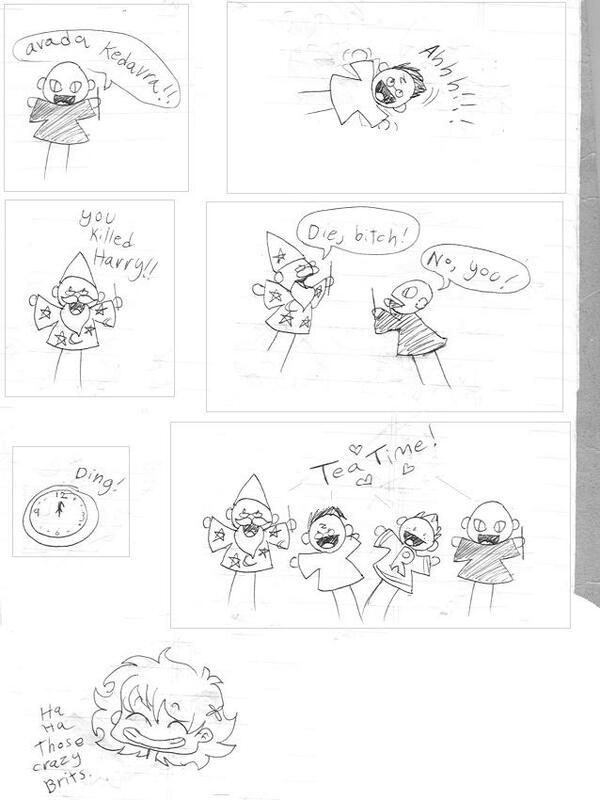 "First of two strips that started it all"
"Second of two strips that started it all"
"Baked With Pride by Emmy C."
"Too Much Bothering" and "Dumbledore's Erised" by Emmy C.
"Harry Potter Has Second Thoughts by Emmy C."
Ron Dancing and Listening to "Aisha" by Neil C.
"Icons and Avatars by minttea, sheepyrai, and mori_kitsune"
"Icons and Avatars by christi_morelei, lena_crest, and lilsilvrphoenix"
"More Icons by minttea and lena_crest"
"Snape Candle Scribble by darkavatar, Real Life Snape Puppet by forknlilo, Gingersnape Cookie by bardess, Icons by mermaidkween, and Cute Sprites by amongstthestars"
"Plotter Puppet Pals By Emmy C."
"Ask Snape #1 By Emmy C. and Caitlin"
"If Snape Was Fat By Emmy C."
"Interview with Neil C. about Potter Puppet Pals"
If you have any of these, please send an email at "mattsparkzz@gmail.com". There's a lot of fan-art on the PPP Fan Community, and there are also sites dedicated to icons and scenes that were created with the Scene-Maker (of note is that Neil made one scene). However, there is too many pages to be searched through. If any of the people from this community or not from would like to post their fanart they've posted there, please do over here. Make sure to give full credit. Demon Got Soul by The CamPanulas, a song about Neil Cicierega that mentions "Dumbledore stripped to the waist".